When a vocal ensemble call themselves the English equivalent of Boundless and claim Bobby McFerrin as one of their biggest fans, they establish high expectations with their audience. 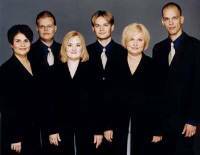 Fortunately, at Tuesday afternoon's sold-out festival concert at Christ Church Cathedral, the six-member a cappella group from Helsinki, Finland did not disappoint. Rajaton's (pron. Rye-ah-tawn) reputation has grown enormously over the past 4 years. Last year, Rajaton's album sales reached 100,000 worldwide. Not bad for a Finnish band that performs mostly traditional music from their own country. The three women and three men of Rajaton come from different musical backgrounds and each offers a unique quality ot the band's synergy. Soila Sariola, (the redhead) Essi Wuorela, (the brunette) and Virpi Moskari (the blonde) are the female members; Hannu Lepola, Ahti Paunu, Jussi Chydenius are the guys. The mood was set with the opening number, an Irish traditional melody, "Dobbin¹s Flowery Vale", typical of what you might hear the from Irish folk group Clannard. More such outstanding arrangements were to follow. The sextet performed a number of original tunes by the young contemporary Finnish composer Mia Makaroff that were delivered with mellifluous voices and a passion for the music. Two notable exceptions were the Beatles' "Lady Madonna," and a crowd-pleasing, over-the-top rendition of ABBA's "Fernando" which featured Jussi Chydenius' skillful use of his bass voice as the percussion section. The singing was impeccable, and the song selection eclectic. All six singers appeared to have an excellent grasp of English and took turns to introduce the songs. The vocal structure remained traditionally harmonic, with solo parts showcasing the exceptional voices of various members of the group. Some other highlights included "Un-Wishing Well," a pleasant calypso-style number, and "Butterfly" a spine-tingling original song about the brevity of life, that the band saved for the encore. As consummate professionals, Rajaton knows that there must be substance to entertainment, so they put their music first. All six singers displayed the same light musical touch that helped make Rajaton's innovative performance of new and traditional music a concert to remember.